One of the most rational and at the same time the most simple fishing equipment performs the mug. It should be noted that the pike fishing on mugs quite successful not only in the reservoirs of the closed type (lake or reservoir), but also in those waters where there is current. Mugs – this is probably one of the few gear that is capable of using factors such as wind, current, and also due to the activity of bait fish, on their own without intervention from the angler, to carry out the movement on the pond. The most appropriate place where possible the most successful pike fishing on mugs in the summer or fall, is such a place in the pond as ples. It should be noted that the ples must be wide and straight, and the descent on ples club will be able to maneuver and to move and the distance is about 300 meters. Otherwise, when the ples is not wide enough, the circle, for example in windy weather, it can get caught in the thickets. In order to increase the catch of pike and increase the number of bites, the mugs must be placed on those areas of the reservoir, where the pits or grooves on the bottom. A great place to set the mug will be those areas in the water where there are snags and snag. However, when fishing with circles snag on parts of the reservoir it is necessary to exercise care and skill, because it is on these parts of the reservoir, though, and a good chance to get a good catch, but the threat of snagging the mug is also big enough. The beginning of the summer season (may, June). With the onset of the so-called Indian summer and before the advent of heavy frosts (autumn — September, October, November). As previously stated summer is to put mugs to catch pike, preferably about snag the parts of the water. This is because this predator over the summer shows high activity and is in constant motion. As a place for an ambush, she chooses the pit areas in the reservoir that is abundantly overgrown with reeds or bushes. With the onset of autumn, pike activity increases significantly. It before the coming frost tries to catch more food. Therefore, in this period of the year to find her first need at great depth or near the shelters of natural origin, which are present in the pond. It should be noted that not all anglers know how to catch pike on mugs correctly. The distance between the snap points should not be less than 5 meters. Before you install the circle, with him to cut the cord, the length of which would allow the bait to fall at a distance equal to 1.5 meters from the bottom. In the end you need to attach a small float, and the cord to enter through an incision placed on the outside of the snap. Classic mug device for catching of a pike in its form resembles a disc made of wood or foam. Its thickness can vary in the range of 25-30 mm, and its diameter is usually 130-150 millimeters. On the circumference of the snap-in is a special groove. Use it to store the stock of the line. On top of the disc is made of two of the cut. They are necessary in order to keep the fishing line after the bait has been impaled on the hook and released into the water. The center of the disc has a hole, which is necessary for placement of the float. About the color of the color, it should be noted that for the visual observation of the snap, the lower part is colored white. The upper part of the circle, respectively painted in red. It is worth noting that according to its structure, a circle is very similar to a familiar, probably, for every angler imitation fish. As with the imitation fish, fishing pike on mugs, provides for mounting on the hook for live bait and its subsequent smooth movement throughout the pond. However, the circle is different from the imitation fish is the fact that it is necessary to pull out after the first bite cutting palmaseca on his prey. hook and leash, made of metal. As cargo, it is recommended to use a sliding sinker of the type which has a weight equal to from 5 to 15 grams. The diameter of the used fishing line in the circle should not be less than 0.3 millimeters. For equipment, this snap-in is best to use the monofil. This is because when using braided fishing lines fish are harder to draw out, as this line hurts the hands. Some anglers prefer to make mugs for pike. For that would make the circle in the home, you will need to use the foam is fine-grained type, the thickness of which is 15, a maximum of 20 millimeters. First of all, the foam sheet before manufacturing of the mug, you need to make a layout. Markings applied with an ordinary pair of compasses and a pencil. The resulting billet of this snap-in cut with a scalpel or a jigsaw. In a pinch, you can use a sharp knife. Diameter in home-made mug, it is recommended to do 5 times greater than its thickness. That is, if the thickness of the mug for pike is equal to 30 millimeters, it is best to make a disk of this circle with a diameter of 150 millimeters. It is worth noting that at the time of manufacture of circles in the home that can be used not only foam. The end surface of the mug, in order that it had been smooth, it is necessary to pre-process, using sandpaper. Then it is necessary to carefully cut or grind a flat groove, the depth of which is equal to 10 millimeters. Directly in the center of the circle you need to make a hole whose diameter is 6 or 8 millimeters. Also on the disk, you have to make two wide slots that need to be precisely positioned against each other. In order to make a mast for a mug, can be used as a starting material wooden rail. One side of the rods is sharpened to a cone shape, and on the other you need to make a slit whose depth is equal to 10 millimeters and a width of 3 millimeters. The final stage of the disk and the mast is painted and when the paint dries rigging is done for mug. It should be noted that directly before painting the circle drive should be several times to impregnate using varnish. This is necessary to ensure that would be during the long stay in water, avoid saturation of her drive. When painting the circle, you need to use a waterproof paint. Otherwise, after a few uses on the disc can cause cracks, and it can be deformed during the process of fishing for pike. It should be noted that mugs are great for catching not only pike of large size, but also truancy, the mass of which does not exceed the level of two kilograms. For catching of a large pike on a circle, it is first necessary to choose the right place to install this snap-in. In this case, the ideal place would be Tonya. Tonya is quite wide and very long river reach, where there is no strong current. In addition, this area of the reservoir there are no sharp changes of depth. Mugs should be placed on those areas of the reservoir, which are a great place for an ambush pike. It could be rocks, holes, bushes, or flooded trees. It is also worth noting that Tonya for pike on mugs, you need to choose in advance, examining her bottom with sonar or the most ordinary of the lot-the depth gauge. To withstand the distance between them. 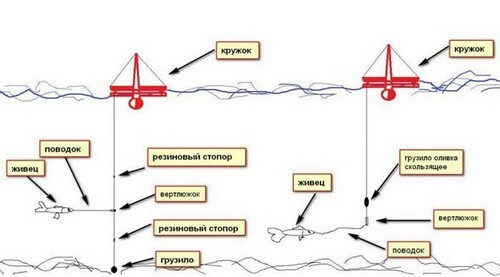 During installation, the circle should take into account the wind strength and characteristics of the reservoir (retention of snags, currents, algae and other things). 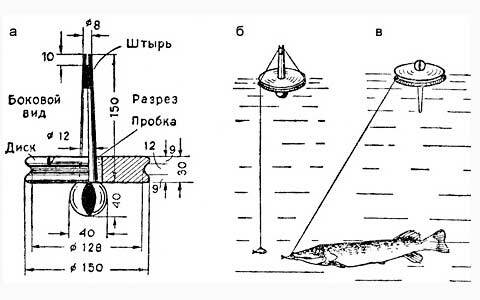 Applying during a pike fishing circles, the use of live bait, the length of which does not exceed the level of 10 cm. As an indicator, which signals a successful angler about biting of a pike is the turning circle. That is, a circle that has previously floated the red side to the surface of the reservoir, suddenly turns white. This signal indicates that a pike attacked the bait. In the event of a successful strike, when the circle indicates the presence of prey, swim up to it to gently without making much noise. In addition, to the mug to catch pike, you need to swim after him and in any case to try to swim to the Cup against his move. Then you need to take the cord and sharp movement to effect cutting. It is worth noting that during the trip the club must remain in the water.